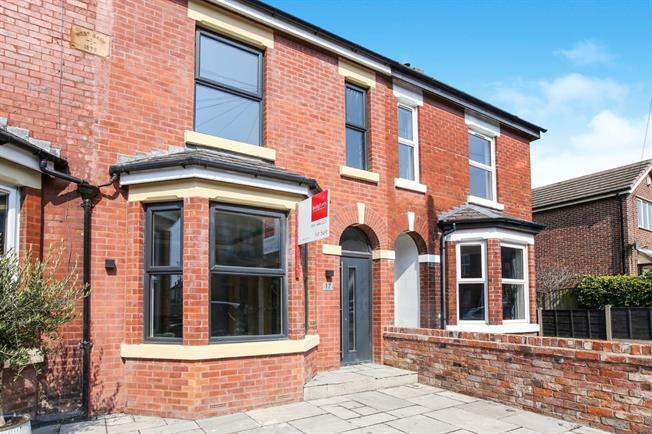 3 Bedroom Terraced House For Sale in Stockport for Asking Price £300,000. On entering the property you are met with double doors leading to a spacious living room with bay window and recessed mood lighting, the dining room and kitchen have been designed in a contemporary style with double patio doors leading onto the newly landscaped raised decked garden. To the first floor are three double bedrooms and contemporary modern fitted bathroom suite. To the front of the property is a flagged driveway providing off road parking, whilst to the rear of the property is a good sized garden with raised decking. Composite double glazed door. Radiator, laminate flooring, ceiling light. Double glazed uPVC bay window facing the front. Radiator, laminate flooring, recessed feature mood lighting. UPVC double glazed door, opening onto decking. Radiator, laminate flooring, recessed, feature mood lighting. Double glazed uPVC window facing the rear overlooking the garden. Radiator, laminate flooring, recessed, feature mood lighting. Marble effec work surface, wall and base units, electric oven, gas hob, over hob extractor, space for washing machine, dryer, fridge/freezer. Newly fitted carpet - feature oak and glass balustrade. Double glazed uPVC window facing the rear overlooking the garden. Radiator, ceiling light. New Carpet. Double glazed uPVC window facing the front. Radiator, ceiling light. New Carpet. Double glazed window with obscure glass facing the front. Heated towel rail, tiled flooring, ceiling light. Low level WC, panelled bath with mixer tap, shower over bath, vanity unit with mixer tap.